I threw myself in front of the money bus for this one, dear reader. $11.99 at Whole Foods! 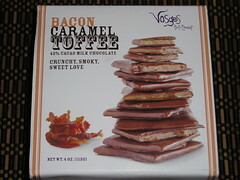 But I couldn’t resist this Bacon Caramel Toffee from high-end Vosges chocolatier. And the bacon is Neuske’s. It’s made with 42% milk chocolate, not dark, but that might be the right thing here, with the extra creaminess offsetting the saltiness of the applewood smoked bacon. Event the salt in the toffee is applewood smoked. This product is an extension of the popular Mo’s Chocolate Bacon Bar I’ve eyed in the Zingerman’s catalogue for some time now. I bought it on the fly during a rush trip to the market Friday night, and haven’t tried it yet. I’ll let you know as soon as I do. Well, now, Faith, you just keep sacrificing yourself like this for your readers! “It’s a tough job, but somebody…, and all that. I’m still saving because of savoring the last four squares of Trader Joe’s bittersweet chocolate from Switzerland – Faith made me do it.